Canadians are used to waiting for new and interesting products to hit the natural food store and grocery shelves and the wait for Sheese has been no exception – well, aside from that “new” part. In fact, Sheese, developed by Bute Island Foods in Scotland, has been around since 1988. The product has undergone several changes and improvements since its humble beginnings and now distributes across the globe – from Europe to Southeast Asia to North America to Africa. Access to Sheese in Canada and the US has been a bit spotty in the past few years, but, thanks to some new distributors, the product is appearing on more shelves lately. According to their website, Bute Island Foods sells not only vegan cheese (and, you’ll notice on the package, that this is not just a “dairy-free alternative”, but it is, in fact, intentionally vegan in the original ethical meaning of the word) but also deli products. I don’t think these are yet available in North America, so I’ll be focusing on just the cheese. 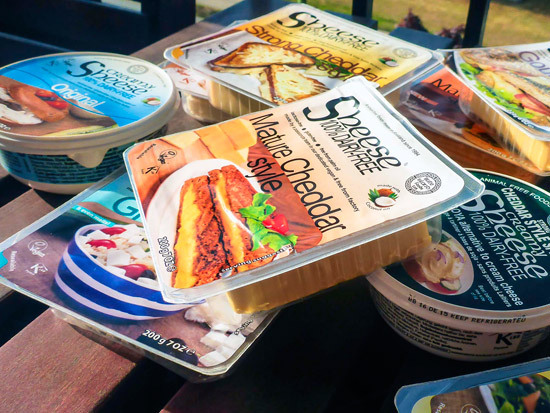 The product line is impressive – six cream/spreadable cheeses, ten styles of block cheeses, and three styles of sliced cheese (not all reviewed here). All Sheese styles are vegan, gluten free, trans fat free, palm oil free, and the website mentions that all ingredients are “sourced as non-GMO.” And with styles like Sweet Chili, Strong Cheddar, Greek, and Mature Cheddar – as compared with other vegan cheeses on the market – it’s about time Sheese had a larger presence. The first style I tried was the Mature Cheddar Style slices. It was a beautiful sunny day that begged for cooking veggie burgers on the grill and I figured a cheeseburger would be even better. After opening the package, the first thing I noticed about the slices was how realistic they looked. There was no weird oily sheen or plastic quality to them and the cheddar-orange colour was pretty spot-on. The second thing I noticed about the cheese was the strong smell. It wasn’t an unpleasant smell, but definitely stronger than I’m used to. It reminded me of the old sharp dairy cheddar that I’d experienced on a trip to Scotland as a teenager, when I had first learned that a lot of North American cheese was pretty mild in comparison. 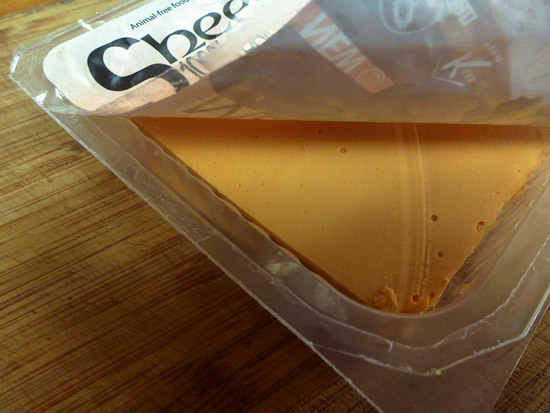 I tasted a small piece of the Sheese on its own and noticed that the texture was very close to what I remember old cheddar to be – a little crumbly but with a slight creaminess. Again, the flavour is strong and there is an aftertaste that I discovered becomes less noticeable after a few more bites. The moment of truth for me, though, was how it took to being grilled atop my black bean burger (served on a tortilla because I like it like that), and this far exceeded my expectations. 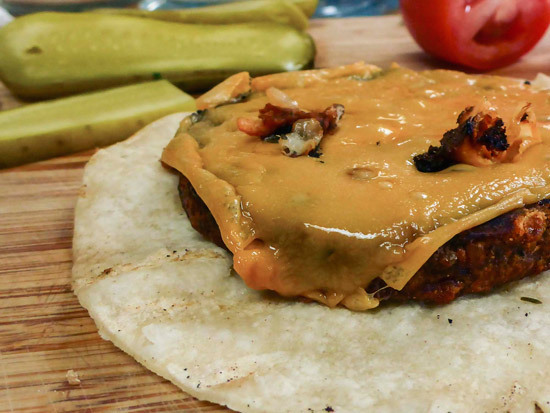 For the first time in all my years of eating vegan cheese, I ate a vegan cheeseburger with perfectly melted cheese that almost bubbled as it was cooked – and the cheese crisped along the edges. The bubbling and crisping were cheese qualities I’d completely forgotten were a thing! The Sweet Chili Creamy Sheese and a bag of gluten-free crackers came with me to a party full of omnivores, and it was pretty much devoured. The creaminess was perfectly spreadable and had a pleasant mouthfeel, while the sweet chili was flavourful with mild heat. 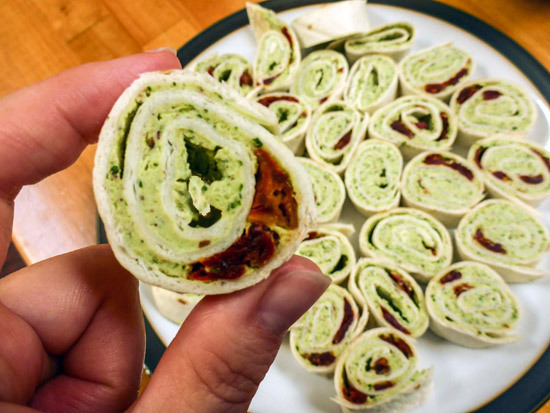 This cream cheese definitely felt more suited to crackers than to a bagel, which the Original and Garlic & Herb versions go very well with (also, pesto cream cheese sun-dried tomato roll ups!). The Cheddar Style spread has the same well-crafted texture and I felt the flavour was too strong to eat on its own, but would go nicely in a sandwich with some lettuce and tomato, or used as the base of a cheesy dip. Apart from the crisping of the melted cheddar style slices, the biggest surprise for me was how close to feta the Greek Style block was, which was tested in a Greek salad, naturally. 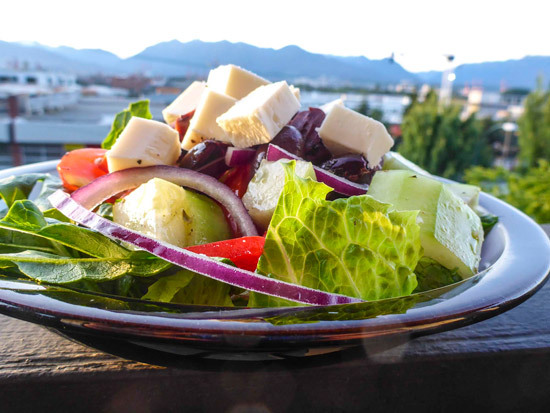 As a kid, I loved Greek salads – that was until age 13 when I learned that feta cheese often came from goats and, as hypocritical as it is, I stopped eating feta at that point, because gross. So, it’s been a while since I’ve eaten feta and the Greek Sheese stepped right in where my memories left off. It was crumbly in a perfect way, salty, slightly briny tasting – perfect with kalamata olives, romaine lettuce, and red onions. I was delighted about eating a Greek salad again and not being grossed out by cheese made from goat milk. Over the years I’ve tried many mozzarella vegan cheeses – some melt, some offer the promise of meltiness but don’t live up to their word, and some just remain hot solid versions of their original form. The Sheese Mozzarella, however, fully lived up to its promise and then some. 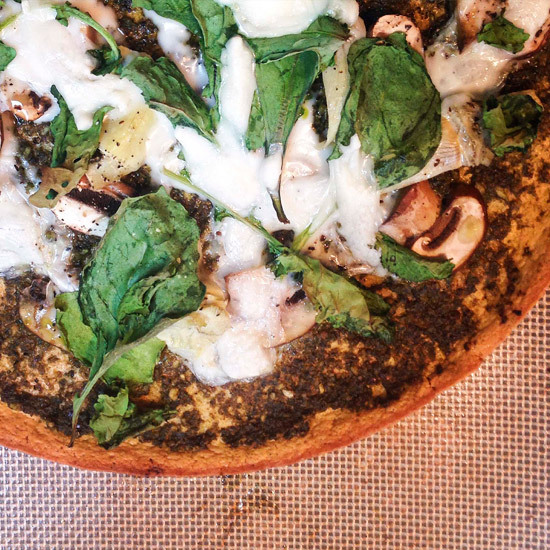 It melted, it spread, and it had a wonderful smooth texture that was perfect on pizza, and if it wasn’t for my crust becoming overcooked, I have no doubt that the cheese would have developed that nice crispy edge if it had been heated longer. 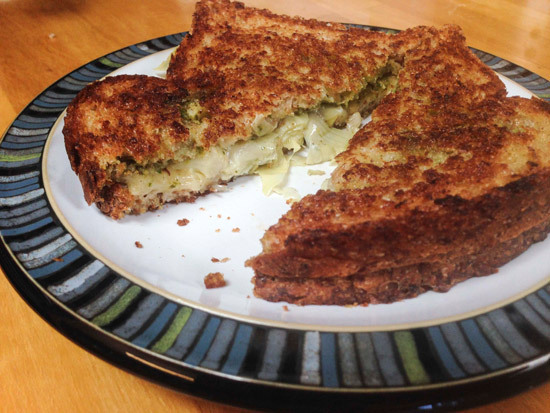 In a pesto grilled cheese sandwich with marinated artichokes, the Strong Cheddar Style was a hit, playing well with the full flavour of the pesto and the brininess of the artichokes. The melted texture was nearly identical to dairy cheese, but without all the inhumane guilt! The only complaint was that the slices fell apart a little while being peeled away from the packaging rather than peeling off in one piece. Such a minor complaint, really. In a world that is increasing in vegan cheese products, Sheese has had enough time and regular improvement to be a really strong contender. I’m happy to see it being carried in more stores these days and hope it picks up in popularity in North America where, really, you can never have too much choice. To find out more about Bute Island Foods and their Sheese products, please visit their website. When Michelle isn’t testing products, she can be found taking pictures of her cats, designing beautiful things (such as The Book of T.O.F.U. ), and slowly becoming an avid BC hiker. You can find her on Instagram at @foodncatz. Comments Off on Review | Say Sheese!